There aren’t a whole lot of other female zombie writers out there. Which is really sad, considering how very awesome my friend, Thea Isis Gregory is. Check out her guest post below, follow her on twitter, and like her on Facebook. You won’t regret it! This chick has a mastery of gore, zombies, and the sort of storytelling that will keep you awake at night, wondering if every bump and groan isn’t a hoarde of hungry undead…. As an enthusiastic cook and a horror writer, I have a number of body parts in my freezer. Not human, of course, but enough that my hoard of meat seems like a monument to the macabre. 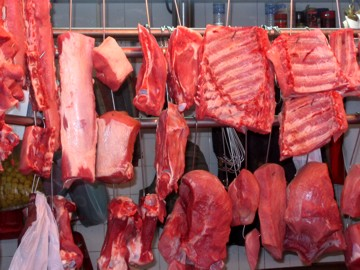 The inspiration for horror that I find in meat is not the having, it’s all found in the preparation of the raw flesh. Home butchering gives you the rare opportunity to observe the dead, and handle a carcass. Of course, the end goal is the meal, why waste an opportunity to learn more about the textures, sensations and contents of a body? One of the best creatures for home study is a simple whole chicken and turkey. In addition to being delicious and economical, chicken carcasses have skin, joints and flesh that can be manipulated and studied. Cutting through and hitting bone, and observing meat grain were the important lessons with whole raw poultry. I even used the skin in one instance to describe a zombie attack on an elderly woman in Locked In. The paper-think skin was such an apt comparison. Pork has been lauded as the most human-like meat. I enjoy examining its different grains, the fatty deposits. Bone-in roasts present another important morsel for observation: the large bones and joints. The bones of a large mammal are a much closer comparison to those of a human. In many ways, I find pork to be the most gruesome of meats for just that reason. Offal (heart, kidneys and liver) are good for insight into that perfect dismemberment scene. Heart muscles are smooth and yet have a texture distinct from any other muscle. Liver is slimy, slippery and sticks to your hands. Kidneys are firm, dense and crunch when you cut into them. The internal organs run the gamut of shapes and textures. In the end, conscientious experimentation is the best way to get the hands-on experience that helps with description and getting the gore well-researched and just right. Do not try this on humans—it’s illegal and messy. Otherwise, get a good filet knife and dive right in, just make sure to wash your hands and sanitize after handling raw meat. Check out Thea’s Zombie Bedtime stories!